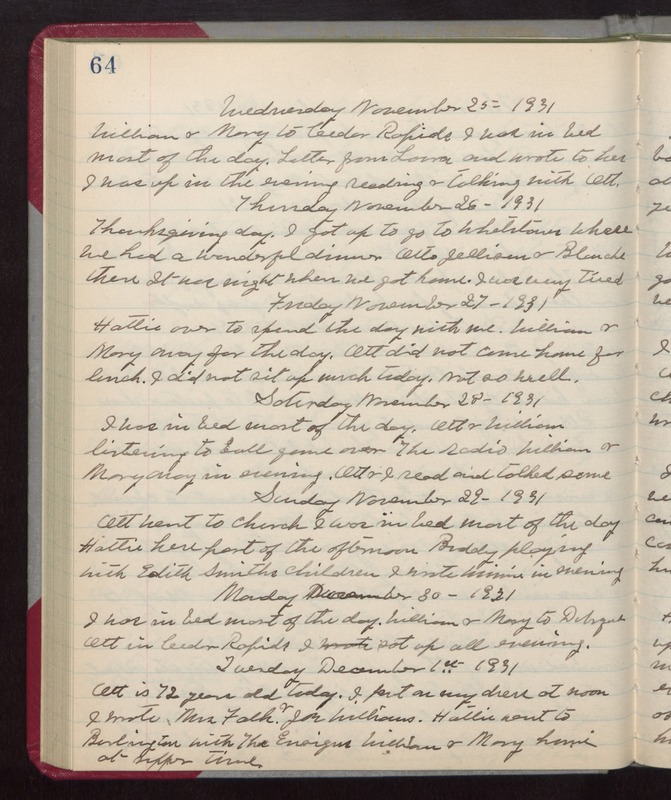 Wednesday November 25- 1931 William and Mary to Cedar Rapids I was in bed most of the day. Letter from Laura and wrote to her I was up in the evening reading & talking with Ott. Thursday November 26- 1931 Thanksgiving day. I got up to go to Whetstones where we had a wonderful dinner. Otto Jellison & Blanche there It was night when we got home. I was very tired Friday November 27- 1931 Hattie over to spend the day with me. William & Mary away for the day. Ott did not come home for lunch. I did not sit up much today. Not so well. Saturday November 28- 1931 I was in bed most of the day. Ott & William listening to ball game over The radio William & Mary away in evening. Ott & I read and talked some Sunday November 29- 1931 Ott went to church I was in bed most of the day Hattie here part of the afternoon Buddy playing with Edith Smiths children I wrote Winnie in evening Monday November 30- 1931 I was in bed most of the day. William & Mary to Dubuque Ott in Cedar Rapids I sat up all evening. Tuesday December 1st 1931 Ott is 72 years old today. I put on my dress at noon I wrote Mrs Falk & Joe Williams. Hattie went to Burlington with The Ensigns William & Mary home at supper time.